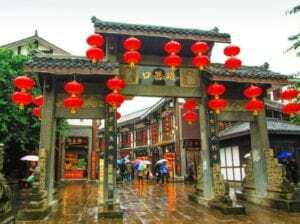 One of the many highlights of any visit to Chongqing is a stop at the Ciqikou Ancient Town. Located on the banks of the lovely Jia Ling River, close to where it merges with the Yangtze, this ancient district dates back nearly 2,000 years. During the Ming and Qing dynasties, Ciqikou was an important producer and exporter of valuable and delicate porcelain. More than 20 ancient kilns have been discovered here, and today, there are dozens of beautiful shops lining the winding streets and lanes of the village. Aside from its links to China’s famous porcelain, there are also many charming artist studios and restaurants here. Some of the district’s best attractions are also the more than 100 tea bars, where you can sit and sip and chat for hours. There is also a stunning Shu Embroidery workshop, which is famous across China. Both for modern shopping and historic charm, a visit to Ciqikou in lovely Chongqing offers a glimpse back at a centuries-old way of life in China.